Yesterday News 12 uncorked a little story putting Hoboken back in the corruption spotlight again featuring a report on the troubling pay to play no bid contracts HHA Executive Director Carmelo Garcia directed without authorization under federal procurement laws while taking thousands of dollars from several HHA vendors. 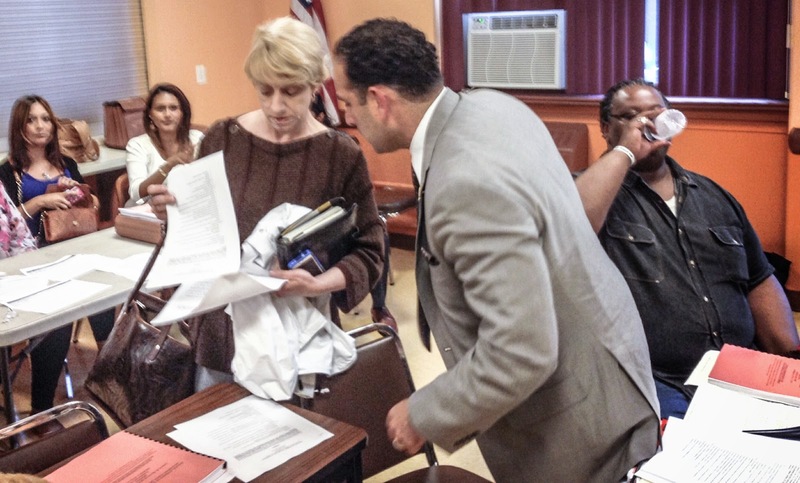 HHA ED Carmelo Garcia confers with ally Councilwoman Beth Mason before a recent HHA meeting. Yesterday News 12 spent some time conferring with the public about the emerging pay to play controversy one of many exploding in the HHA. State Senator Brian Stack must be observing with keen interest. The rest of Hoboken is watching with bated breath. The complete News 12 story with video is available here. Talking Ed Note: Sometimes what follows the big lights is the big time. Look at me ma, I'm a star. Related: The MSV breaking story back in May that brought to light payments to Carmelo Garcia by HHA vendors who were paid millions from the agency with no bid contracts.